Situated on the southern banks of Lake Erie, Cleveland is a city of green parks, turn-of-the-century architecture, diverse neighborhoods and historical districts. The city of Cleveland has evolved from its industrial roots into an appealing place for visitors and residents alike. Cleveland's stunning architecture, interesting districts and leafy parks, together with its numerous galleries, shops and restaurants, all combine to account for Cleveland's appeal. 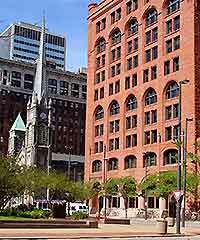 Over recent years, the city of Cleveland has reinvented itself and been reborn with neighborhoods and districts such as Cleveland's Tremont and the Historic Warehouse District. These popular and busy districts attract affluent young professionals and a trendy, bohemian set of artists. Along with this boom has come the introduction of some world-class restaurants and a lively art and nightlife scene. Downtown Cleveland has been reinvented and is now full of cultural attractions and museums, such as the Rock and Roll Hall of Fame and the Great Lakes Science Center. 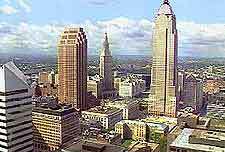 Cleveland is also known for its cultural diversity and districts such as Little Italy, Lorain Avenue and Ohio City are great places to sample some international cuisine. 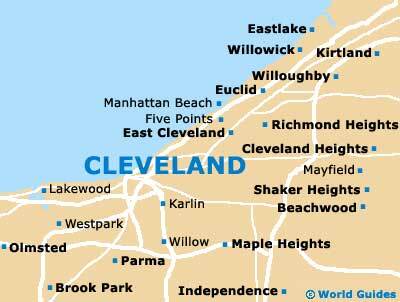 Here are Cleveland's main districts and neighborhoods. Like much of Cleveland, the city's downtown district has undergone a facelift in recent years. Once littered with chimneys and other signs of industrialization, downtown Clevedon is now packed with many of the city's hotels and is home to sports stadiums, government buildings and shopping centers. Key attractions in Clevedon's downtown district include the Rock and Roll Hall of Fame and the Great Lakes Science Center. In short, there's plenty for visitors to see and do in the revived and rejuvenated downtown area. Listed on the National Register of Historic Places, the centrally located Warehouse district is another prime example of Cleveland's transformation into a city that's alive with the young and affluent. Downtown's oldest commercial center, the Warehouse district of Cleveland is now teeming with galleries, boutiques, restaurants and nightclubs. This neighborhood is also a residential area featuring hip loft apartments and historic architectural gems. Cleveland's Little Italy is a mere stone's throw from the University Circle district, with its museums and cultural institutions. First settled by Italian artisans over a hundred years ago, this charming neighborhood is full of character and offers some of the best Italian cuisine in Cleveland. For all things Italian, head for this neighborhood where the cobbled streets are lined with excellent restaurants, galleries and coffee shops, making it a great place for a relaxing afternoon or an evening of fine dining. Quirky and diverse, Cleveland's Lorain Avenue has an eclectic mix of historic landmarks, flea markets, ethnic restaurants, pubs and antique shops. After visiting one of Lorain Avenue's ethnic restaurants, which include Mexican, Greek, Middle Eastern and Oriental eateries, there are numerous pubs and inns in the area where you can enjoy lively evening entertainment. Situated across the river, opposite the downtown district, the Ohio City neighborhood is one of Cleveland's oldest and most ethnically diverse districts. Once settled by Irish and German immigrants, Ohio City now home to more than 15 ethnic groups, making it a fantastic place to find international cuisine. The West Side Market has become a city landmark here and boasts hundreds of stalls selling all manner of fresh produce. This district also has a sizable selection of hip galleries and a lively arts scene. Perched above the Flats, Tremont offers visitors fine views of the river and Cleveland city, and a large sedate park complete with a bandstand and small pool. The district is another of Cleveland's success stories that is characterized by regeneration and rejuvenation. Along with its new affluent inhabitants has come a tide of fine restaurants, trendy pubs, art galleries and stylish shops. Located 4 miles / 6 km east of downtown Cleveland and just a few minutes from Little Italy, University Circle is home to most of the city's major cultural attractions including the Cleveland Museum of Art, Cleveland Museum of Natural History, Botanical Gardens and the African-American Museum. Aesthetically, this is a pleasant neighborhood filled with lovely architecture and leafy gardens. There is one word that sums up the Shaker Square district of Cleveland - shopping. 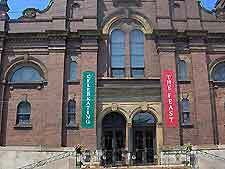 Listed on the National Register of Historic Places, this is the oldest shopping area in Ohio and offers visitors boutique shopping, a wide range of restaurants and a six-screen cinema. The district is also known for its antiques shops and art galleries.